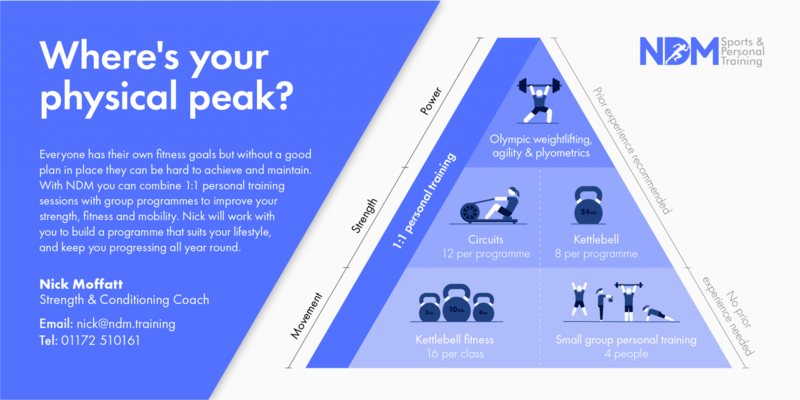 In reflecting and reviewing the various group and personal training I was carrying out during 2018, and NDM Sports & Personal Training’s evolution into 2019, I revisited my mission, vision and values, and sketched out how I believed I could best offer a unique and high quality range of programmes and session types, for the maximum benefit of participants of all levels. Luna9Design spent the time learning the nature of the services I provide and quickly understood how I believed they fit together. This led them to create the key paragraph. They’ve shown very clearly and well enough of what each programme or session involves, aiming to be a conversation starter for me with new clients. The pyramid shows stages of physical literacy, what experience if any is needed, and roughly the qualities developed. It is applicable because for Power we need Strength, and for Strength we need quality movement. Now ofcourse it is rough because most of my sessions actually incorporate and flow through all of these, also progressing or regressing exercises with individualisation within group. All of it is designed to be complimentary training to support all that people do in their activities, their lifestyle and the rest of their week. For some there will be some clear transfer to sport performance and reduction of risk of injury. For others there are energising workouts that also stimulate mind and body. There are routes to continual progression – one never needs to plateau. The more I do the more I see the power of the 1-1 sessions; even a one-off, to dramatically increase someone’s physical literacy and then enable them to get the most benefit from the appropriate group training sessions and programmes. At any stage this can be a game changer for people’s lifestyle. It is so rewarding seeing those who commit consistently to the group training continue to develop stronger fitter faster! We’re getting great results, long term enjoyment of the process, and vision of where groups and individuals want to reach to. The sky is the limit. NDM Sports & Personal Training brings you “Man-night Mondays!” My personal struggle to simply train consistently!